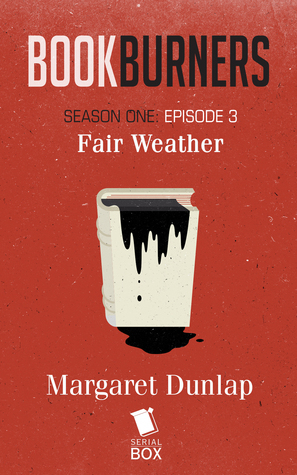 In some ways, Margaret Dunlap’s “Fair Weather” is an echo of the winning formula that Brian Francis Slattery’s “Anywhere But Here” established in the previous episode: Sal explores a bit of the Vatican, Sal meets some new team members, the team’s “magic 8-ball” alerts them of a magical event, they deploy, they fight, they win. But “Fair Weather” has got some wrinkles for you. The team’s mission this episode is to investigate what’s happened at a nearby bookstore in Rome. Wait, did I say at a nearby bookstore? It’s more appropriately to the nearby bookstore: though the shopkeeper had told Asanti that he’d got an old book for her to take a look at, when she arrived to take a look, it was gone. As Slattery did so successfully in the last episode, Dunlap pops us out of Sal’s point of view for some key scenes, picking up with the Australian-accented Katie (something we get from the audio edition, though not in textual clue form, yet, which is very interesting to me) returning to a private yacht, with an old book tucked into a plastic bag. She’s the head steward for the mysterious Mr. Norse, who has both chartered the boat and has often assigned Katie the task of checking out local bookshops. This is the first one she’s brought back aboard, a fact which first mate Paul notes with some curiosity before Katie dutifully locks the book in the yacht’s safe. Back with Sal’s team, they quickly decode the clue she returns with. Deck shoes plus uniformed polo shirt plus enough cash to buy an ancient book equals a private yacht. Which means Ostia, a nearby harbor suburb. Arriving at the harbor, they notice that one of the yachts is blurry. Which, yeah, that can’t be good. And Sal notices something else: that tour guide she met near the bookstore? The one that maybe asked one too many questions? He’s lurking nearby, too. He’s got a plausible excuse, but coincidences around magical books are not to be trifled with. But Sal doesn’t have time to sort this out, as Liam needs her to help them try to get aboard the blurry Fair Weather, whose Captain Childress isn’t exactly welcoming. Sal comes up with a gutsy, and risky, bluff that really shouldn’t work, but some snappy dialogue later, they’re on deck. And it’s now the world outside the yacht that’s blurry. Yeah, that can’t be good, either. Also not good? The first mate we met in Katie’s point of view a bit earlier? Yeah, he does not want them taking the book. And he’s got a knife. And Father Menchú is within striking distance. Luckily, instead of a middle-aged Catholic priest bleeding out on the deck, we get to see Grace being a badass instead, and Paul is under control. Until he isn’t, and the knife is in motion again — this time, though, the target is his own freaking heart. Yeah, that’s really not good. The goo’s still there. The world’s still blurry. The working theory is that the ancient book’s cracked binding has “leaked” its magic and influence, and there isn’t exactly a manual for “hazardous magic cleanup” given that nobody really has a working understanding of magic, at all. Does Sal’s plan work? Is the Pope Catholic? Dunlap gives us a lengthy denouement here as well; things aren’t as tidy in the aftermath of magical contamination, particularly for Katie who may or may not be infected with the same black-oozing magic that turned Paul into a walking advertisement for Ginsu Cutlery. Though Sal promised to protect her, the Vatican takes no chances and takes matters into its own — or perhaps hired — hands. In fact, the whole team was close to having been “cleaned up” as well. Very close. And even after all this: knife-wielding attackers, bodies melting into ooze, failing to protect Katie, fire-bombed yachts, or perhaps because of the many times death came close to knocking loudly and firmly at her door, Sal finds out quite definitively that Liam is most definitely not a monk. And! We have even more denouement. We have the denouement’s denouement, a parting scene to turn the mystery up another notch. Who blew up the bookshop, if it wasn’t the Vatican? How did “tour guide” Aaron get Sal’s phone number, and show up again and again? She finds out that her employers “aren’t the only players in the game” and then Aaron leaves her (and us!) with one final image burned into her retinas that totally changes the game. Thinking about the merits of this story, it’s funny: the act of writing this Listen-a-Long recap — in which I re-read the story in text to make sure I was getting it right — raised my estimation of this episode from my first impression. That first impression was still good, a high, high 3 stars, not quite a solid 4, due to my usual deductions for things like “no, that bluff really shouldn’t have worked” and “no, Katie or other humans like her wouldn’t actually react like this when they see their boyfriends melt into black goo and learn about evil magical books” and even, I’ll admit, a bit of “really, Sal, after the person you vowed to protect was offed by someone in your own organization you’re ready to jump into bed with Liam?” but the re-read brought out the pacing, the unexpected twists and turns, and surprises and mysteries (such as, wait, who is Mr. Norse?) that Dunlap managed to pack into her (to my knowledge) third published story. I’m revising up to a solid four. And looking forward to her next episode. Meanwhile, I hardly feel like I need to mention it, but Xe Sands is again fantastic. We get a few new voices I expect to hear more of (Canadian Ranger, Vatican monsignor, Aaron) and the international cast of the yacht, doing a particularly good turn with an Australian accent for Katie. This entry was posted in The Bookburners Listen-a-Long and tagged margaret dunlap, serial box, xe sands. Bookmark the permalink.